Chicken Fajita Quesadillas are the perfect weeknight meal recipe and great for Mexican food night! They’re so easy to make right at home and you’ll love this variation of the traditional quesadilla. If you feel like throwing your own little mini fiesta for dinner this week, I have the best recipe for you. 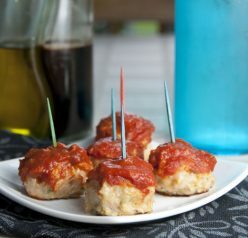 Once you see how easy these are to make, you’ll make these over and over again. You know those times when 6 PM sneaks up on you and you have NO plan for dinner? This happens to me every once in a great while. I’m lying. It happens to me multiple times per week! These Chicken Fajita Quesadillas or these Greek Chicken Soft Tacos are almost always the solution to my dinner problems. If you’re reading this right now, I’m either really close to having the baby and laid up on the couch, in the process or having her, or I have already had her. I am trying to write some posts ahead of time because I have no idea how long I’ll be down and out for once I have the baby! Before I have the baby, I’m not sure how much blogging I’ll feel up to doing so I’m trying to get ahead. This is a huge life change but I’m hoping it all goes smoothly and without a hitch! I don’t want to abandon my blog because I’ve worked so hard to make it my business and I’m planning on keeping it going for as long as I’m able! We are getting our house ready to add our little roommate. It’s crazy to think there will be three people living here so soon! You know how you get so set in your ways and change just seems so strange? Her little room is almost ready and hopefully will be 100% done by the time she arrives. I realize that babies don’t sleep in their own rooms for up to six months, but it just makes me feel better to be well-prepared. Also, who has time to get a room ready with a newborn baby? 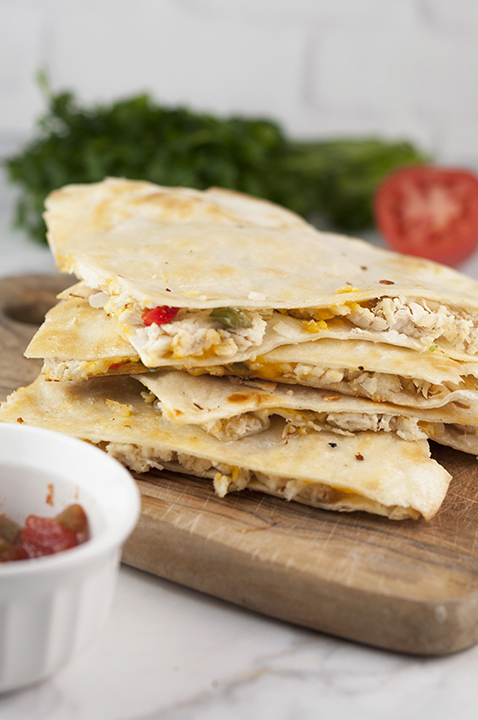 These Chicken Fajita Quesadillas are perfect if you have leftover chicken/pulled chicken. These Crispy Southwest Chicken Wraps are another favorite of mine for using up leftover chicken! I normally have tortillas on hand, ALWAYS have cheese on hand (duh), and all I had to buy for this recipe was the peppers. Easy meals are the best! 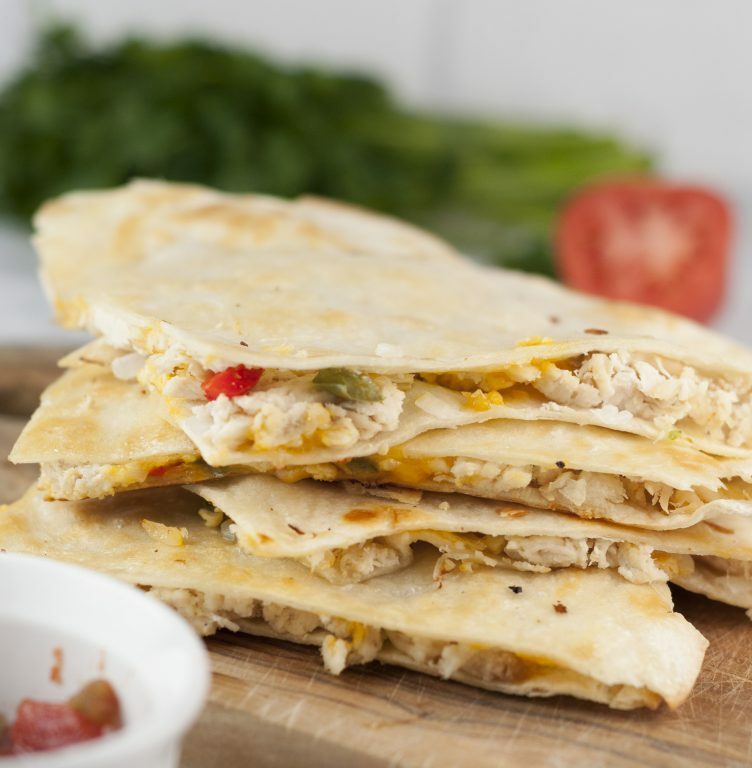 As much as I love plain chicken and cheese quesadillas, I love this twist on them and so will you. A similar meal you have to check out is my Chicken and Avocado Burritos. The burritos are perfect for the summer – nice and light! Enjoy! Chicken Fajita Quesadillas are the perfect weeknight meal recipe and great for Mexican food night! They're so easy to make right at home and you'll love this variation of the traditional quesadilla. 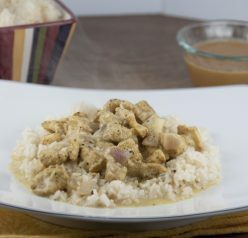 On medium heat, cook chicken in large skillet sprayed with cooking spray or use a non-stick skillet. This takes about 5 minutes or a little less. Add onions and peppers; cook until slightly softened. Stir in salsa and beans; cook 3-4 minutes or until heated through, stirring occasionally. Scoop ¼ cup chicken mixture onto half of each tortilla; sprinkle with cheese. 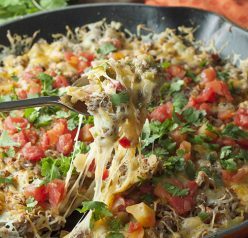 Add quesadillas, in batches, to a large skillet sprayed with cooking spray; cook on medium heat for about 2 minutes on each side or until lightly browned on both sides. Enjoy warm! Hope everything has gone well/is going well/will go well with the baby! Anyway, what a neat dish — and I’m always look for ways to get a quick dinner on the table. Thanks! What a fun twist to the traditional quesadilla! Sending you hugs as you finally get to meet your baby! !